In an effort to ward off some of the winter chill, we’ve gone hunting for the best that the pompom-adorned accessories we can find. There’s a party on your neck and everyone’s invited. This super fun necklace from Rosantica is all kinds of awesome. 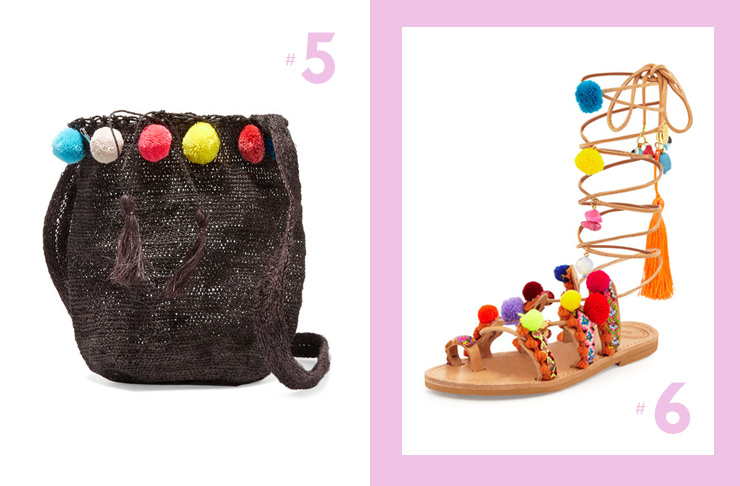 Pair it with something simple for it to really pop, or forget the rules and go colour on colour. Be ready to wow everyone at the Spring Racing carnival with this amazing Rosantica gold tone headpiece. 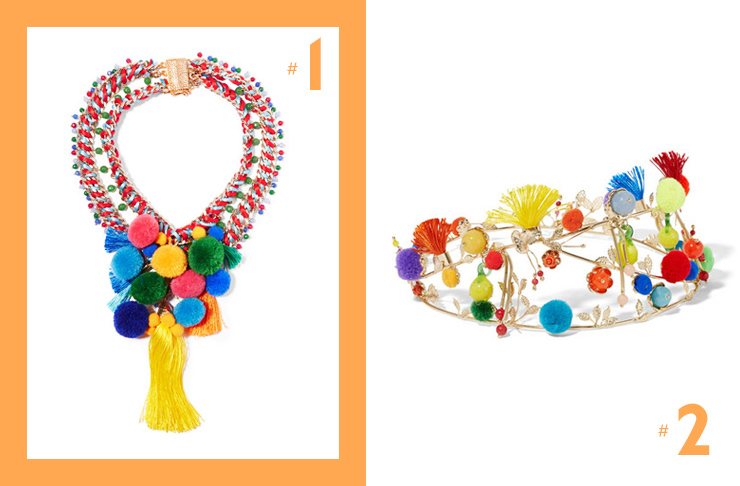 With pops of pompoms and multi-coloured quartz, you’re sure to stand out from the crowd in this stunning piece. Pompoms and tassles? Get outta town! This hat by Sensi Studio gives off that “can’t sit with us” vibe and we’re totally into it. Perfect for festivals, Saturday wandering and market shopping, we’d even wear this at the dinner table (if our mums would let us). This shoe is everything. 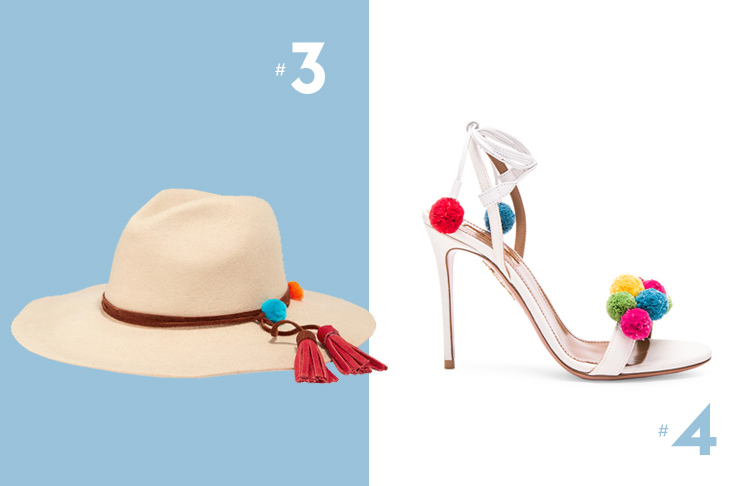 With the colourful pompoms accenting the white leather and its perfect heel height, it’s a winner no matter how expensive. Whether you’re wearing it to a party, or just to the office, your day can only get better when you wear these bad boys. This bag is your perfect summer carry all. Woven from lightweight and durable straw by women Kankuamo tribe in Colombia, this is not only the cutest bag in town, it supports tribal women. Looks good, does good? Take our money. Rumoured to be the one that started this whole trend, the Eliana Linardaki Penny Lane Pom Pom Gladiator sandal is a pom pom lover’s dream. Hand made in Greece, using pure Greek leather, this luxe gladiator sandal features handmade friendship straps and semi-precious stones (coral and turquoise). For Love and Lemons is delivering again. And this time it’s with this easy to wear dress. Dress it up with heels, or keep it casual on a weekend away and you’ll look 10/10 each time. Want a subtle way to join in with the cool pom pom kids? 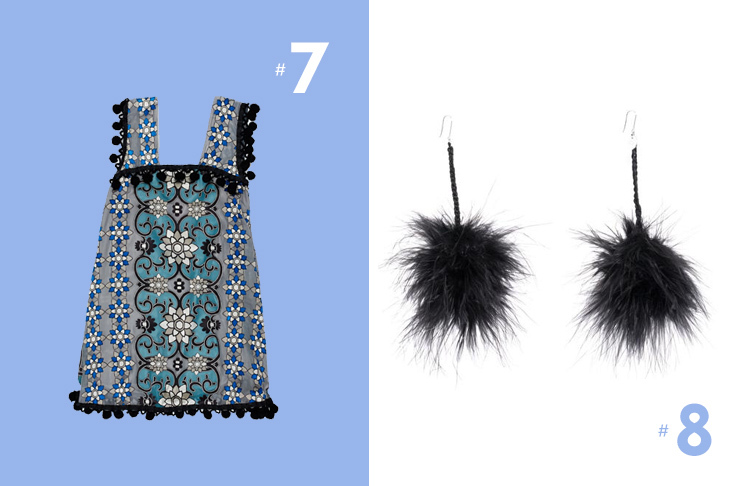 Look no further than these super fluffy Poms earrings. They’re made in Melbourne and come in a wide range of colours so there’s something for everyone.